Welcome to the Converse Blog's Weapon Wednesday. Today I have a real treat for you, an OG team colorway of the Weapon. 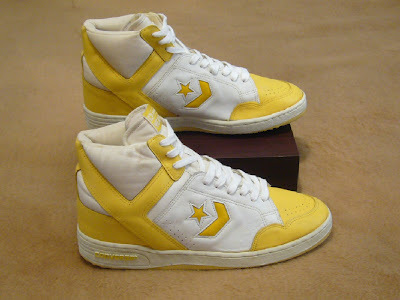 This is a rare colorway for sure, a white/Yellow high top straight from the 80's. Also I want to give a shout out to Fernando Berdones, these pictures and shoes are his. 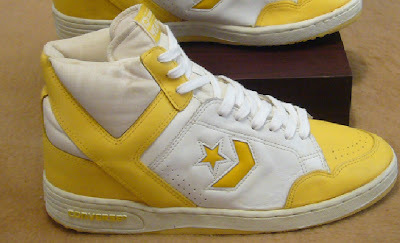 I also hear that he has a lot of other vintage Converse, so I hope to bring you all some more heat from him soon. These just look weird with out the purple we're used to seeing with the yellow. Well that's it for today, but I want to remind everyone about Rodney Rodgers on TNT tomorrow night. For those of you that don't remember Rodney finished up his playing career wearing Converse. Last November he was in a dirt bike accident that has left him paralyzed from the shoulders down. Thanks for checking out the blog!